Pikirayi bomber SBD DAUNTLESS. In 1934, the US Navy announced a competition for the creation of new carrier-based dive bomber, according to the American classification — scout-bombarde-Rossica (scout bomber). The main requirement for a new aircraft — a significant increase in speed compared to BOM-Bardi rustami predecessors. Bomb load was to be placed under the fuselage on a special suspension unit with a catapult device, which provided a safe separation of cargo at high speeds during the dive. The fleet was ready to consider any proposal, regardless of the aerodynamic configuration and other characteristics of the aircraft. Of the projects that presented the number of companies, including Martin, Vought, Bruster, Curtiss, and Northrop, October 11, 1934, the Navy chose several designs and ordered prototypes of cars for the comparative tests. The first is already 15 October 1934, received order firm Bruster. The aircraft was given the designation SBA-1. The construction of the prototype ended 15 April 1937. The project provided for installation on the aircraft engine R1820-4 of the company Wright power of 420 HP But flight tests showed that characteristics of the aircraft with this engine are very low. After replacing the motor on an experimental XR1820-22 with an output of 740 HP speed reached 263 km/h, but still according to this indicator, SBA-1 completely lost to competitors, and the fleet is ordered to the firm Bruster only thirty aircraft. Their production ended in September 1938. Serial machines were produced with more powerful engines R1820-38 (950 HP), able to disperse the aircraft to 411 km/h, but on the fate of the machine is not affected. These aircraft were mainly used as training. Part of the SBA-1 flew from the aircraft carrier “hornet”. In March 1942, wrote off the car. More successful was the firm Vought, which offered fleet two biplane XSB3U-1 monoplane and the XSB2U-1. Both cars in April 1936 he was sent to the base Anacosta for comparative tests. Won monoplane, and the firm has received a rather large order. In December 1937 the squadron VB-3 began to receive the first serial aircraft company Vought SB2U. New carrier-based bomber, the Northrop company was created on the basis of army attack aircraft A-17. Northrop, the designers first tried to turn it into a carrier-based fighter. But after the mariners rejected the prototype of this aircraft XFT-1 (reduced variant a-17), the work was connected to the branch office in El Segundo and he began to do a dive bomber. The leading designer was appointed engineer Edward Heinemann. To reduce drag and increase maximum speed of flight Heineman has equipped the plane of the chassis, retractable into an oblong fairings under the wing. This option allows you to save the power elements of the wing center section and to reduce the cost of production, as A-17 passed all kinds of tests and equipment for large-scale production was ready. Given the stringent requirements for the length of the running deck of the aircraft, Heineman put on a plane a more powerful engine R1435-94 Twin Wasp Junior of the firm of Pratt & Whitney power 825 HP vs 750 HP at the engine And-17. The prototype machine was given a new designation HVT-1. The first flight HVT-1 was held in July 1935. In flight was achieved a maximum speed of 341 km/h. the First order for 54 aircraft VT-1 was admitted to the firm Northrop in April 1936. Built machines, about 39 were in part on the carriers “Yorktown” and “Agerpres”. The last production aircraft (serial number 0627) Navy returned to the factory for the purpose of conducting research and improvements. On this return he insisted, mainly, the military — they proposed to increase the machine speed, to get rid of the bulky fairings under the wing and to replace the high maintenance motor Twin Wasp Junior. 28 Nov 1936 these requirements were formalized as a Supplement to the main contract. Satisfaction of all these requirements resulted in the creation of virtually a new airplane. Chain reaction radical changes opened the replacement main landing gear is fully retractable. Necessary alteration of the center section of the wing changed flow conditions in the vicinity of the tail, which had to be changed. New engine R1820-G113 company Wright Cyclone 1000 HP had other dimensions and mount, respectively, had to change and shape the nose of the plane. The novelty of the machine has said the s — HVT-2. The first instance of a dive bomber took to the air on 22 April 1938. Test flights have brought one problem after another, because the aerodynamics of the car has changed, and analytically to find the optimal configuration for individual elements of the plane was very difficult. In February 1939, the machine was sent to purge in full-scale wind tunnel at Langley. There specialists NACA carefully examined the fluid dynamics and has developed the necessary recommendations for improvement. At this time, the firm Northrop, which is experiencing serious financial difficulties, sold the firm Douglas branch in El Segundo, along with the aircraft. When HVT-2 returned to his home factory for modification, it’s expected a new name — XSBD-1 DAUNTLESS (“fearless”). 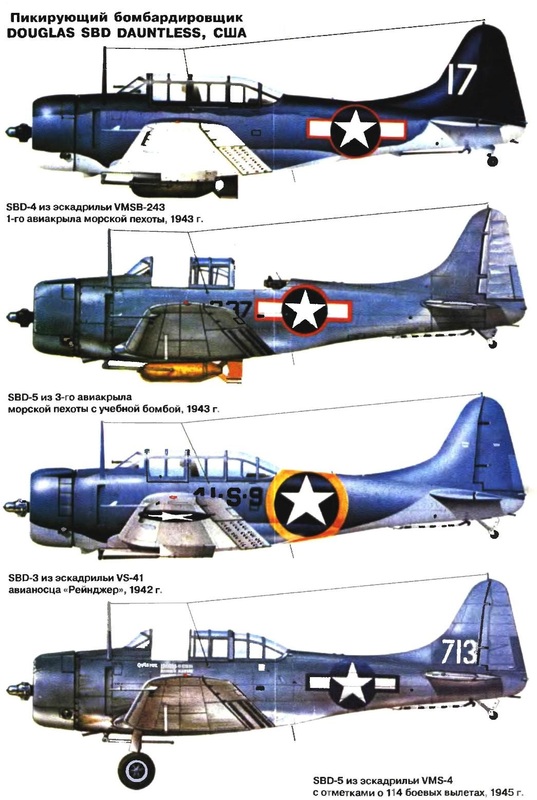 After reviewing the new aircraft (now by Douglas), the command of the Navy ordered 57 vehicles SBD-1 marine corps machines and 87 SBD-2 for carrier-based aircraft. The second modification is different from the first increased by 795 litres fuel capacity (total 1173 l) and another engine (R1820-32) the same power. Both aircraft carried the same weapons’. 7.62-mm machine gun at the shooter, two machine guns in the bow, one 454-kg bomb under the fuselage and two 45-kg bombs under the wings. In spite of the increased take-off weight, the second modification is not inferior to the first in flight speed and ahead of its predecessor in the flight range of 586 km. The first aircraft is a SBD-2 was squadron VS-6 and VB-8 on the USS enterprise and VB-2 on the Lexington at the end of 1941. When the war broke out, the DAUNTLESS bombers from the aircraft carrier “enterprise” in the air, on approach to the Hawaiian Islands. Japanese Zero suddenly attacked the American aircraft and shot down seven of the 18 flying machines. Thanks to the good aerodynamics and strength of structure SBD was able to perform all aerobatics, and it immediately felt the Japanese Zero when the two broke and fell to the ground. 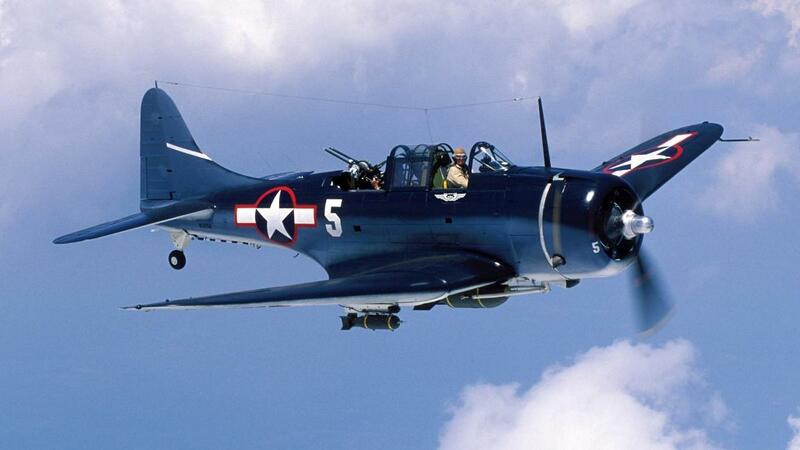 Land “Dauntless” SBD was not so lucky — the Japanese destroyed 29 aircraft. Almost a year before these sad events in the units of the fleet began to enter the third, more modern modification to the SBD. It takes into account all the pre-war wishes of the military. DAUNTLESS received all the necessary attributes of combat aircraft of that time: Proektirovanie fuel tanks, coaxial defensive machine gun and armored windshield. Land version of this modification without brake hook was designated as A-24. In the beginning of the war the DAUNTLESS proved itself from the best side. 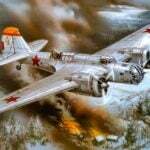 High reliability, high accuracy bombing and the ease of control was used as much as possible, because the Americans had to fight with the numerically superior enemy. A particularly striking episode of the war period with the participation of SBD is considered to be an operation to repel the Japanese landing in New Guinea, or “Battle of the coral sea”. On account of “Fearless” in that battle was a light aircraft carrier “Shoho”, several landing craft and shot down a dozen enemy fighters. Then the SBD fought for Medusa Atoll and Guadalcanal. The first bomber SBD-4 with the new propeller entered the army, 18 October 1942. The designers also replaced the 12-volt power system of the aircraft at 24 V, allowing to install new fuel pumps. Total built 778 aircraft of the fourth modification. The most popular and latest serial modification of the deck was the fifth variant of the DAUNTLESS, released in huge quantities — 1549 copies. They installed the engine R1820-60 Cyclone with a capacity of 1200 HP This power is allowed to increase the bomb load to 726 kg on the node under the fuselage and up to 147 kg under wing. The first car came into force in February 1943. In July 1943, the production aircraft SBD-5 installed a new engine R1820-66 with a maximum output of 1350 HP, increased fuel tanks and sent for testing under the designation SBD-6. 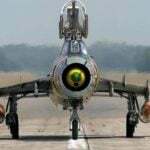 Naturally, the characteristics of the aircraft have increased, but in production it does not run steel. As a new carrier-based dive bomber of the fleet chose the monoplane Curtiss Helldiver of the company. 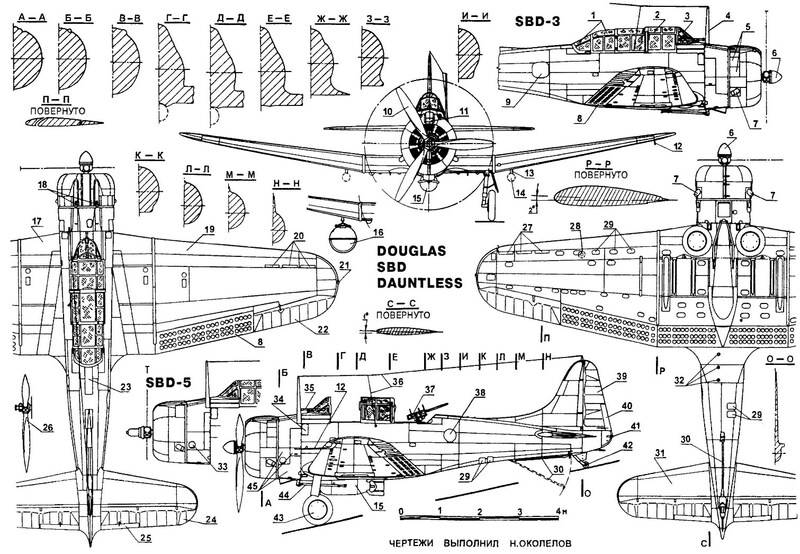 For all the time production firm built 5936 Douglas DAUNTLESS aircraft. In parts of the fleet they operated until the summer of 1944, after which they gradually sent to be scrapped. During the war the DAUNTLESS bombers, acting independently or in a team, torpedo, sunk, six carriers, three cruisers, four destroyers and one submarine of the enemy. SBD DAUNTLESS — a double single-engine cantilever low with a closed and a fully glazed cockpit and retractable landing gear. Fuselage — all-metal semi-monocoque working with a smooth lining. Technologically, the fuselage was divided into three sections. Front includes engine mount, fuel tank, oil tank and exchange the guns. Next is fire power frame, followed by a Central section of the fuselage. It housed a crew cabin, fully enclosed plexiglass lantern with frontal bulletproof glass. In the cockpit, in addition to the standard control devices of the engine and flight instruments, established compass marine sample, fixing it to the visor of the cockpit, above the glass, and autopilot. The pilot seat had a back, defending from attacks from the rear hemisphere. Behind the cockpit housed the gunner. In his cabin were oxygen equipment, radio, inflatable rubber raft’s supply of food and means of sustenance in case of a forced landing. In the turret installed one (in the later versions — two) machine gun to protect the rear hemisphere. The tail part of the fuselage and the center section was performed by sealed, which ensured for a long period of buoyancy of the aircraft during landing on water. The wing is of all-metal structure of the trapezoidal shape at the root had the profile NACA 2415, and at the end — NACA 2409. Wing setting angle plus 2 degrees. The center section without transverse “V” and the end part with a transverse V = 10°. Power set of the wing of the so-called multi-besonderen design. It was going from a narrow longitudinal sections, separated by vertical bulkheads. Such design was typical for the firm Northrop, and was used on most aircraft of the company (for example, DC-1 and DC-3). Across the rear edge of the wing, installed the brake pads. Central and lower sections of the cantilever flaps deflected down at an angle of 42 degrees, and the top — up to 37.5 degrees. The lower section, in addition, worked on takeoff and landing as the flaps. Across the span of the brake pads had perforations three series of through holes. This ensured the effective operation of the stabilizer and elevators disclosed the flaps. Aileron asymmetrical profile with fabric covering mounted on the end of each section of the wing, and on the left was located trimmer. With the aim of improving the ailerons at high angles of attack of the wing in front of them at the front edge of the wing was made shaped air tunnels (continuously running” slats). On the left of the plane (in front of the rounded wing tip) was established barbell with PVD pointer speed. Tail unit all-metal construction was carried out in the usual way. The stabilizer had an angle plus 1 degree. The profile of vertical and horizontal models — symmetric. Rudders and height of the trimmed canvas. Chassis is standard for its time, with the tail wheel. Basic rack without the struts. Go wingspan to the Central axis of the aircraft profiled in the niche. The wheel flaps had not closed. The tail wheel fixed, front wheel is closed by a fairing. In the lower rear fuselage mounted brake hook. Issue and cleaning gear, landing hook and brake flaps — hydraulic. Depending on the modification of the SBD was equipped with an engine Wright R-1820-32 Cyclone with 1000 HP or its later modifications Wright R-1820-50 and Wright R-1820-60 increased power (1200 HP). All SBD used a three-bladed propeller Hamilton-Standard, late-model — Hydromatic.